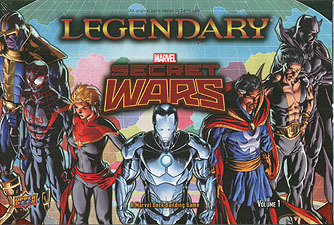 Secret Wars is upon Legendary: A Marvel Deck Building Game. In Volume 1 of a two part expansion, players will use their favourite characters from the Marvel Universe before it comes to an end. For the first time, play as Black Panther, Dr. Strange and Thanos! This 350 card set includes new Heroes, Villains and Schemes. It is up to you to decide who will survive Marvel's Secret Wars.